I thought it appropriate to end 2009 with a post that reflects the Christmas season - while paying tribute to distinguished craftsmanship, artistic sensibilities and vision. A friend once confessed that he was dreading Christmas because he felt very lonely, and this holiday triggered a longing for real friendships perhaps as much as he recognized he had none. While his statement was surprising, I interpreted it as a profound need to connect with people, and experience a sense of belonging. Such statements - and such longings - resonate with me and, while they may come across as dramatic, I love the profound and meaningful friendships that I have been only too fortunate to have come across and cultivated. Christmas, for me, marks a time to pause, to reflect and to believe in the possibilities of rebirth and renewal (Christ's birth in Bethlehem so long ago remains a powerful symbol of hope in a better future). It is also a time when we renew our stock - symbolically or effectively - with gifts that are strong symbols, in my mind, of the spirit of renewal and renewed hope. So it is in this spirit that I picked "Zabavushka" as the perfect Christmas item. Russian for "fun", "Zabavushka" is a composition of references to various children's games and heroes from children's tales. It reminds me of the coffers of toys I always imagined children to have (I was never that lucky) that open up to reveal entire universes hidden away by a simple lid. 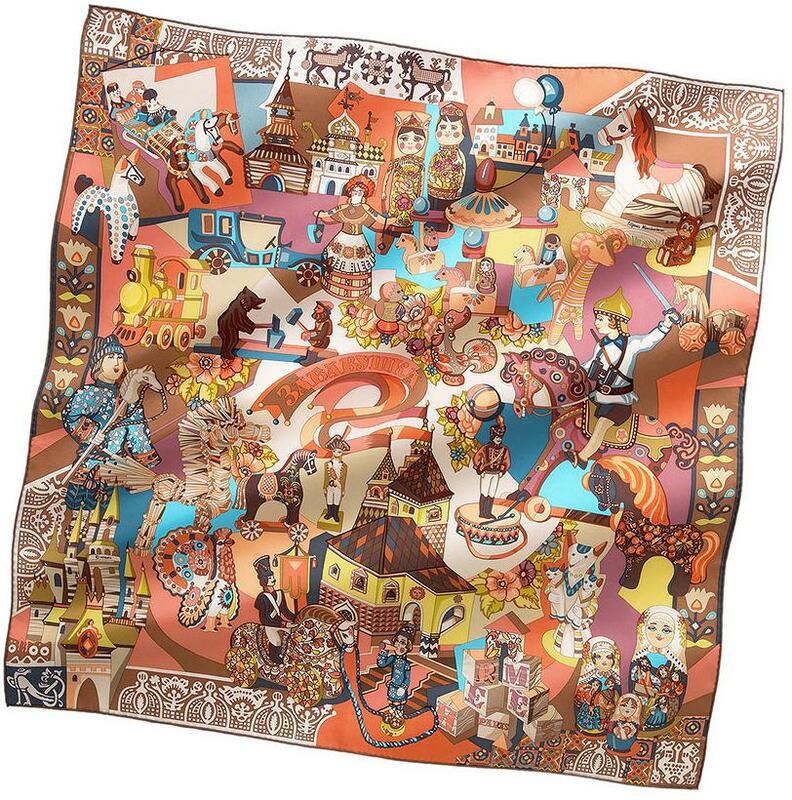 While many toys are universal (the train and locomotive, the castle, the horse, the rider, dolls and lettered cubes), the design equally contains elements that make reference to specific Russian traditional folklore or fairytales, artfully inserted throughout the scarf (the matryoshka dolls, the ornate turkey, the horse rider and the dancer). The assembly of all these elements is somewhat disorderly, perhaps symbolic of the contents inside a toy chest. Given the busy design, this scarf is more appropriate for someone with a strong sense of self who wouldn't shy away from displaying it. Thanks to the rather incongruous design, I loved the message this scarf sends: despite a mishmash of messages and items, perhaps even dissonant gifts, Christmas is a time to celebrate and to find comfort in folks thinking of us, sending love and thoughts our way, and even finding sometimes the perfect little gift to uplift our spirits. 2009 is coming to an end, and with it we choose to remember - or forget - the events that took place throughout the year. An end means also a new beginning. As our hearts fill with joy, as the hours shine more brightly and as our hopes blossom, may we all welcome 2010 with renewed energy and optimism, and enjoy good health, accomplishments and inner peace throughout the new year and beyond ! Happy New Year ! 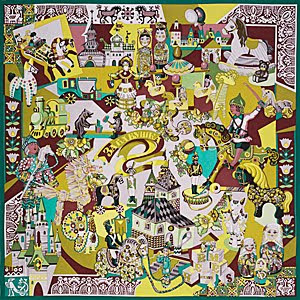 This is a reinterpretation of the "Venetian Feasts" composition on cashmere/silk. 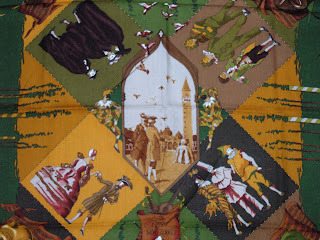 The colours are autumnal (in particular the border's aubergine, forest green and mustard orange), yet the twirling ribbons, the Venetian masks and the dressed-up characters depicted around the center instill a playfulness reminiscent of the nature's rebirth, a sentiment that only a select few designs achieve. The focal point is a rendition of Piazza San Marco (St. Mark's Square), the administrative, social and cultural heart of Venice. I have been fascinated by this scarf from the moment I discovered it in someone's very lovely treasure chest (she herself a uniquely lovely lady) and I continue to find it enchanting in all aspects. 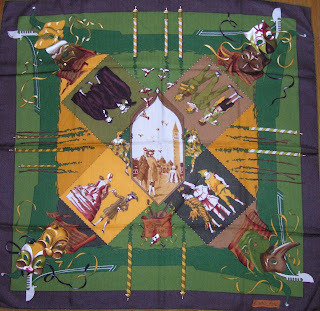 Unlike pure silk, whose weaved fibers tend to render the finished product a little more rigid, the make-up of this fabric (65% cashmere, 35% silk) allows the scarf to lay graciously around the wearer's neck, shoulders or waist, instilling an enchanting elegance, different than the effect of pure silk yet equally distinguished. The texture itself adds an additional layer of depth to the design, the herringbone pattern of the weave becoming visible from close-up. I settled on this scarf today not only because of its playfulness, but also because the image of the horse inside the pattern is like a treasure discovered in the days before Christmas - when, as a kid, I used to rummage through the entire house in search of "Santa"'s gifts. Often times I managed to find them successfully, and the excitement increased exponentially in anticipation. As a grew older, I gave up the searching part, but I held on to believing that a gift is even more impactful if it's something I want, and less so if, upon opening the package, I'd discover something I didn't care for. So ordering my own gifts continues to be a way of life for me. 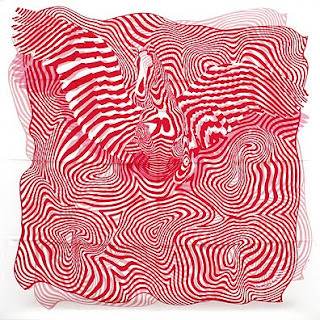 Dimitri Rybaltchenko created this design in 2005, depicting two super-imposed images of the same "onde de chic" ("wave of chic") pattern, slightly off-center relative to one another, with the one in the background of the same colour scheme but faded in intensity. Within the pattern there's the image of Pegasus, a winged horse that appears to be in flight towards the viewer, wings spun across the entire upper part. The horse, its noble spirit transcending its image, gives both distinction to the scarf and instills the element of surprise, so treasured by many. For me, the horse image inspires freedom and fills my lungs with energy and my spirit with enthusiasm. This scarf ties wonderfully, and the same colour palette allows the wearer to emphasize his/her best features through it. I have been struggling with this post for several days now, for I wanted to pay tribute to another Hermes design classic yet the feelings that this design triggers are, for me, mixed: the glory of this luxurious and imposing galley, world-famous and recognized for its symbols, is shadowed by the image of the many souls condemned to hard labour working the oars under the deck. The contemporary depiction of that social stratification was beautifully captured in James Cameron's "Titanic", albeit in a less intense if somewhat romanticized manner. "La Reale" ("the Regal one") was the venerated galley in the service of King Louis IV of France. In the French nomenclature of galleys, a "regular" galley had 26 pairs of oars, with 6 oarsmen per bank. "La Reale" was considered an "extraordinary" galley as it had 32 pairs of oars with the same number of oarsmen per bank (6). The design depicts the stern (back) of the galley, in all its splendour, thanks in part to the impressive size and in part to the opulent decorations, symbolic of the opulence at the court of the "Sun King". Of interest is that the design itself is not depicting the oars. The galley is illustrated within what appears to be a canopy, depicting the French royal insignia - the "fleurs de lys" ("lily flowers"). The tassels from each of the four corners give the tie a more traditional "feel" when the scarf is knotted. 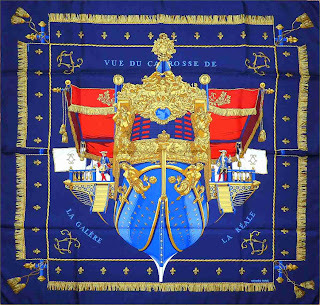 Similarly, the colour combination of this scarf is more traditional - particularly the "royal" blue and the gold accents, although more recent reissues of this scarf inspire a more contemporary "feel" thanks to a limited variation of colour combination (a predominant soft green, for instance, makes the scarf feel younger and contemporary). One such design combination had a burgundy border, a white inner border and a overall burgundy illustration, which again made the scarf very chic without coming across as too traditional or "antiquated". At first I found this design too busy and too traditional, but my thoughts carried me back to it when I listened, the other day, to Nana Mouskouri's "Amazing Grace". The song triggered not only a feeling of spirit uplifted, but also a particular piety and a profound reverence towards the forces above us that guide us through life and which ensure that we will fulfill our destiny (forces that I accept without questioning - first, because my mind is too limited either to understand or visualize what they are; and also because this is the very definition of a believer - one who believes, therefore who has no need to question - and I consider myself a believer). 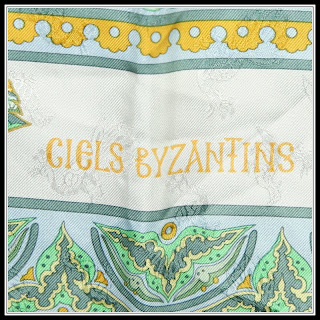 "Ciels byzantins" ("Byzantine Skies", Julia Abadie, 1997) is an homage to the tremendous influence the Byzantine arts and sciences have had on other cultures and to the development of modern societies. The Byzantine (or Eastern Roman) Empire was the Roman Empire during the Middle Ages. As the distinction between the Roman Empire and the Byzantine Empire is purely a modern convention, it is not possible to assign a date for its birth, but conventionally the transfer of the administrative capital in 324AD from Nicomedia (in Anatolia) to Byzantium, on the Bosphorus, by Emperor Constantin is a major reference point (alternatively, the "birth" of the Byzantine Empire is considered with the renaming of Byzantium in 330AD to "Constantinople - and the formal creation of Emperor Constantin's city); the fall of Constantinople to the Ottomans in May 1453AD is associated with the fall of the Byzantine Empire). The Empire remains one of the most powerful and influential empires in Europe - economically, culturally and militarily. 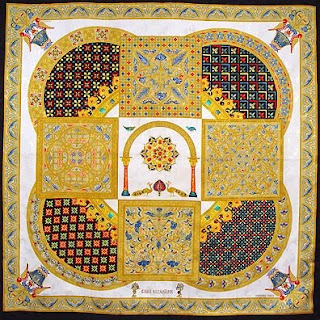 Early Christianity adopted the peacocks as symbols of immortality and illustrated them in paintings and mosaics, so of interest is the depiction, in this scarf design, of the two peacocks by the entrance archway. Finally, the squares between the arches, as well as all along the border, depict typical intricate patterns illustrating Byzantine interior decorating motifs, completing this design rich in symbols, as is the Byzantine culture. The aspect less visible in this picture giving the scarf a further element of exquisite beauty is the jacquard silk, with a peacock pattern weaved within the fabric (here's a close-up picture of the same design in a a different colour palette). The way the song (and Nana's interpretation of it in particular) has such a profound effect on me, of piety, of reflection and of gratitude for all we have and equally don't, so does this scarf instill in me a sense of hidden beauty that not many experiences in our life reveal unless we're open to recognizing and appreciating it. Collection SS2005: Hola Flamenca ! Today is my birthday, and so it's only appropriate that I feature a scarf that I consider to represent me best. At first, I picked a dip dye scarf for I thought both it and I are unconventional. Yet, a very dear friend of mine disagreed, pointing out that its overall spirit does not encapsulate mine. 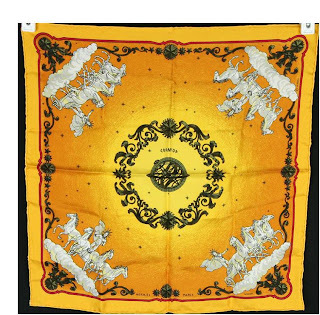 So I embarked on a search for a scarf that exudes vitality, exuberance, love of life, sophistication, and - naturally - artistry. What came to mind is the "Hola Flamenca!" design of 2005, by Dimitri Rybaltchenko (a tremendously talented and prolific designer whose unconventional creativity often results in truely magnificent creations), and indeed, now I can say decidedly that THIS is the one ! There's something else fascinating about this scarf: its intense (yet subdued) colours, suggestive of a profound spirit, sensitive, compassionate and very generous. Definitely Costin ! I love how vibrant the design is, and how full of life the entire picture is, and how its name denotes the sensuality of the female artist displaying her grace on Andalusian rhythms. A wonderful design that shows beautifully knotted. I would equally venture to say that this entire scarf is "bigger than life" - as I would like to be remembered - and I consider it a good reflection of me as well. My friend has also confessed to wanting, one day, to own a dress like this one, to spread open, twirl and be drawn into its mesmerizing waves. Today's posts continues the day's "travel" theme by transporting the viewer to a totally different universe. Cosmos is a scarf originally released in 1966. 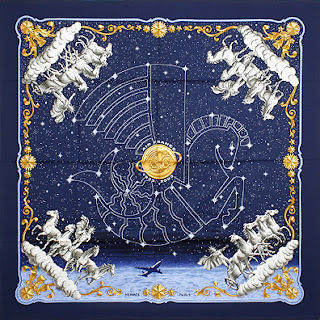 The design, by Philippe Ledoux, was popular enough with the Hermes admirers to command subsequent re-issues, in 1991-1992 and in 1999 (and again in 2003 in 140cm cashmere/silk combination). Each series had many different colours, from the darker, more mature hues of blue, green and burgundy to other more "playful" colours. I picked the yellow colour to display the theme because I find it both different and uplifting. The four corners depict chariots reminiscent of Apollo carrying the Sun across the skies. Albeit traditional, this design is a "classic" of the Hermes collection. 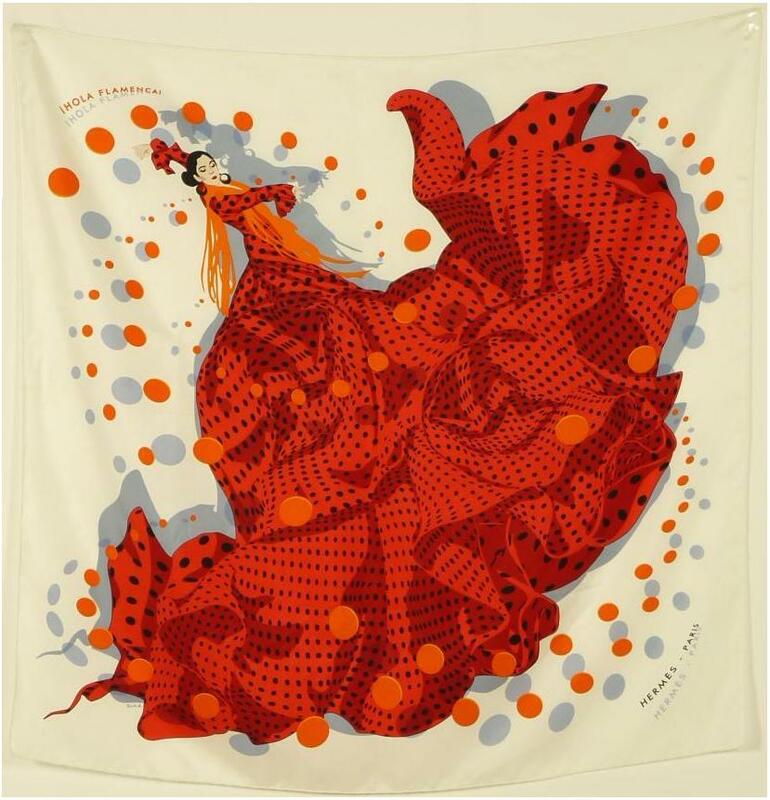 A more recent reinterpretation of this scarf, in 2003 - depicted below - marks Air France's 70 years anniversary. Note the added text around the centre image ("Air France 1933-2003), the superposed hippocampus (the company's logo, representing a mythical sea horse with two forefeet whose lower body resembles that of a fish and ending in a dolphin tail) as well as a plane underneath it. 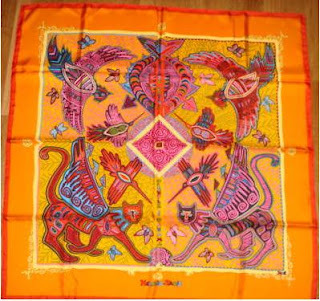 This scarf, by Zoe Pauwels and issued in 2002, depicts a truly magnificent illustration of stylized animals and birds, symbolic of the artform of the Kuna people - the name of an indigenous people of Panama and Colombia. 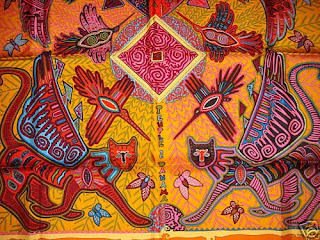 The colours, reminiscent of the textiles proudly made and worn by Kuna women (famous for their techniques of appliqué and reverse appliqué of weaving) are vibrant and very warm. 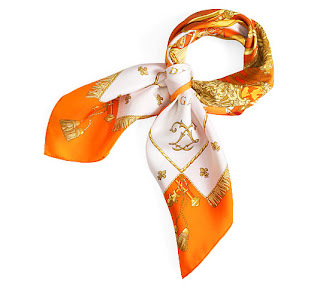 The design is harmoniously rich and shows beautifully when the scarf is worn. One of my favourite scarves, depicting - in my mind - the true Japanese spirit of exquisite beauty through simplicity, this limited edition is a fabulous scarf both to wear and to display in a frame. Ginza is a "quartier" (district) in Tokyo world-famous as the "shopping Mecca" of Japan. The most resonant names in retail world-wide opened shop here and have been mesmerizing consumers with their creations. Hermes is no exception: the Ginza boutique rises some eight stories high and lures admirers with a vast selection of items and choices, far beyond your "average" Hermes store. As the real estate in Japan is at a premium (and Tokyo's in particular is exorbitant), most retailers choose to develop and grow "vertically", so the shopping experience remains tremendously rich despite a rather limited footprint of the location on the ground. The sensation of a world apart (within a world apart, particularly for me, as a European living in North America) is further enhanced by the emblematic opaque glass bricks that embellish one side of the boutique and that allow a distinct sunlight to brighten every floor without any visual distractions from the outside. A definite "must" in this iconic building for anyone seeking memorable experiences.